Composition seems easier when you simplify what to show the viewer. If I look at these two images, captured a few minutes apart you can see what I mean. 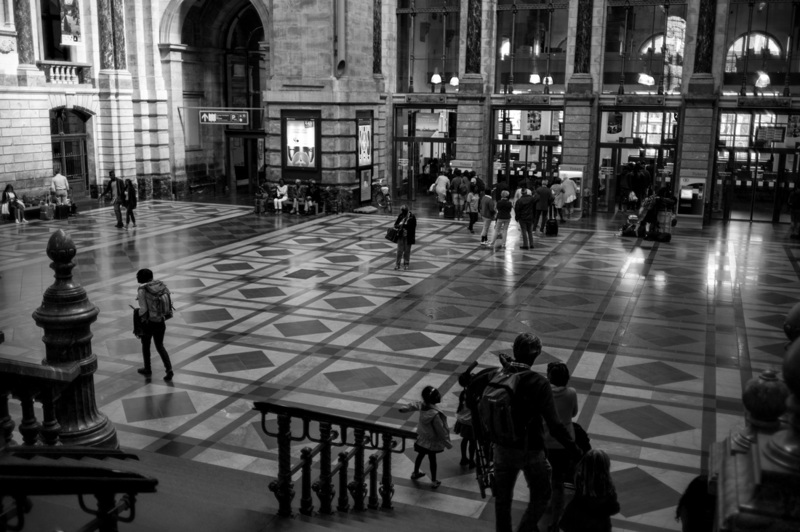 I was trying to find a way to capture the wonderful tile pattern on the floor with the human element of the people walking around. The image on the right was my first attempt where I composed the shot to have the leading lines of the handrails and tile pattern leading the viewers eyes into the picture. The problem is that there are a bunch of people at the station. Too many things to look at and focus on. On the image on the left I simplified it. 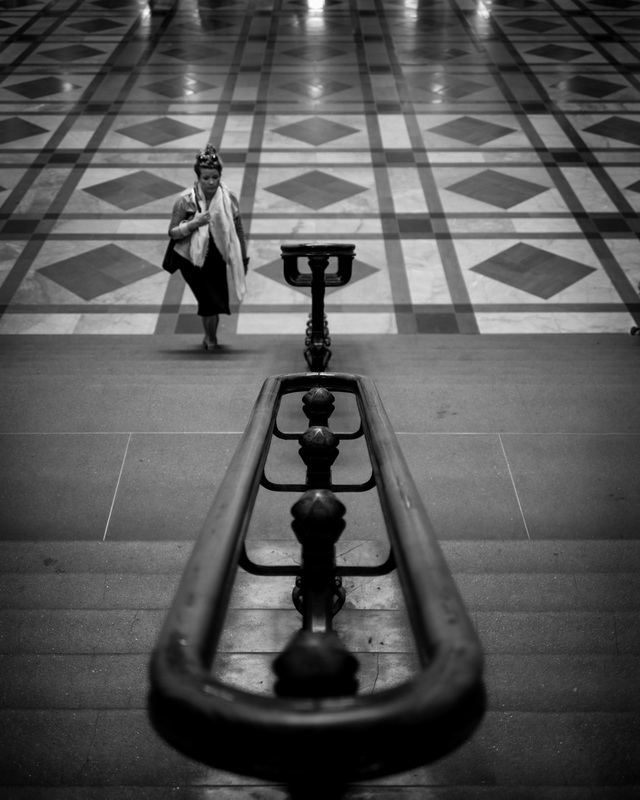 I focused on the lady coming up the steps, made the handrails more obvious by centering them on the image, and allowed them to lead the viewer to the lady walking up the stairs. In post processing I cropped the image down a bit to block off the people that were originally visible at the top of the frame. This is much easier. A single point of focus is simple and clean to compose versus the complexity of multi elements, all of which need to be balanced just so. I am not suggesting that a single compelling element is the only way to compose, I am just suggesting that it is the easiest. The question is if an easy composition is less compelling than a multi element one? The examples above are poor as I believe the single element composition is strong while the multi element one on the right is utter crap. I just find myself struggling to balance out a multi-element scene. With still life this is easier but still a challenge. 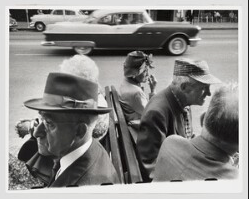 Looking through Robert Frank's "The Americans" this morning I am impressed with his ability to balance such complexity in a seemingly simple style. For an example an image he captured (at left) in St. Petersburg, Florida is a complicated scene. Here we have a wonderfully expressive mans face on the bottom left of the image. As I travel into the image, I go from him to the bench up, into the top of the photo where I see a speeding car and then back down to the lady sitting by herself and the two older gentlemen sitting on the right of the frame seeming to be in conversation. It works. It works well. Heck I cannot imagine a better way to show the scene. It is well thought out, executed with a bit of luck (we all need that) and he has an image for the ages. Now I do not pretend that all of these thoughts crossed Mr. Frank's mind when he capture the image. I do believe that he saw something worth capturing (hence he took the image) and when he made his contact sheet this picture made the final cut. While editing his pictures he understood the compositional strength of this image, the dress, the car and the wonderful faces built a great image. While composition may not an obvious, conscience thought when capturing an image, it certainly is in the selection of images to show. Editing work is a second chance and thinking about composition and seeing if you managed, through an element of luck, to capture the strongest way of seeing that particular scene. I still wonder if there can be a multitude of good compositions of a particular scene and if so how does one go about picking the best? Looking through Magnum's "Contact Sheet" book (one of the best photography books I own) I can see some of the masters 'working' a scene, taking image after image of a particular element from different angles. Working to find a strong vantage point and then trying to capture it when the right elements step into view. ​Look at the image below from Claude Dettloff. 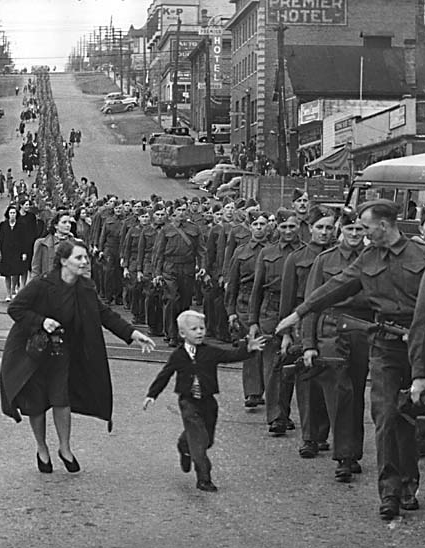 Here he tells us that he was composing the image to capture the long row of men walking through a Canadian city. He was shooting a Graflex (a camera I own) which means he had a single 4x5 negative to expose without reloading. He had the composition held the camera up and thankfully waited. He waited because he knew he had his composition for a few minutes as the row of men stretched for some time. He saw the family following the men, and waited to see if an emotionally compelling event presented itself to him. A young man broke free from his mother's grip and went to his father. His composition nailed, the 'decisive moment' presented itself and he captured one of the greatest images of WWI. He only took one image that day because he knew that he had nailed it. Was their luck? Sure but the composition still works without the boy and his mother. It does not carry the emotional charge that this image carries and it would have been forgotten quickly. But the composition was perfect. ​I still have so very much to learn.